The provisional road and off road calendar is now available to view. It can be accessed via the Calendar link on the right hand side of this page or can be downloaded at the end of this article.. Please check that your event is correctly listed. If you have any queries please contact Anthony Mitchell, the Ulster Calendar co-ordinator for 2015. He can be contacted via email on sportsprint.mitch@btinternet.com. The provisional leisure calendar will be available shortly. There is a huge range of events on this cominng weekend. I have posted any details below which I have received. On Saturday the Giant's Causeway Sportive kicks off and is sure to get a lot of support. On Sunday Testers will face the epic 100 mile Ulster TT Championships, off roaders will take to Kilbroney Forest Park for the National Maraton Championships while there are at least six leisure events to chose from for those who want to get put and about. 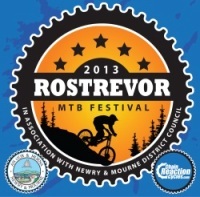 Rostrevor Mountainbike Festival in Association with Newry & Mourne District Council will take place next weekend between 4th - 6th May. Practice kicks off on Saturday 4th May and three local clubs, each specialising in different disciplines, will be organising the events to ensure a very special rider experience. This will take place on Sunday 15 April 2012 at Ballykelly Forest, Limavady (subject to Forestry approval) and will be hosted by Strabane/Lifford CC. The course was last used back in 2000. There are 12 race categories in total for the Under 8s up to seniors. Sign on opens at 9.30am.